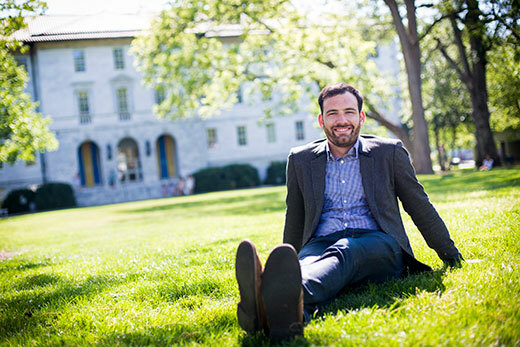 Although he attended Skidmore College, Jared Greenbaum’s own undergraduate journey mirrored that of many Emory students. He went to college intending to be a premed biology major, but along the way changed his mind. He merged his interests in theater design with art and business courses to create a self-directed arts administration major. It was, he says, a way of figuring out how to be a professional in the arts world. Six years later, as an MBA candidate at Goizueta Business School, Greenbaum, the 2017 graduate recipient of the Marion Luther Brittain Service Award, used his particular combination of skills and experience to facilitate a transformative moment for student governance at Emory. The Brittain Award is presented each year to two graduating students, one graduate and one undergraduate, who are considered to have performed the most “significant, meritorious and devoted service to Emory University, with no expectations of recognition or reward.” It is given under provisions of a gift by the late Dr. M. L. Brittain, former president of Georgia Institute of Technology and alumnus of Emory. After his 2011 college graduation, Greenbaum worked as a production coordinator at Nickelodeon in New York and Los Angeles as well as for a talent management firm that produced movies and television shows such as "Silicon Valley," "It’s Always Sunny in Philadelphia" and "The Mindy Project." As in college, he chose to earn an MBA to augment his artistic pursuits. “I’m definitely interested in the more creative side of entertainment,” he says. He chose Goizueta Business School because of its small size, unique among its Top 20 peers. Plus, his sister was a 2013 BBA graduate. It felt like the right choice. “I could focus on and do what I wanted to — supported without being lost in a giant machine,” he says. After Commencement, he plans to drive across the country to Los Angeles to continue his career in television and film. In his first semester here, Greenbaum sought ways to work with students outside of Goizueta. He became graduate business school representative to the Student Government Association. “It was an eye-opening experience to see how student government really worked on this campus, and the differences between graduate students and undergraduates,” he says. His plan was to become the Graduate Student Government Association’s chief of staff, but no one ran for president. “Me running against nobody made it a really easy race,” he says with a laugh. Easy, perhaps, but ultimately significant for him and for Emory. As GSGA president, Greenbaum helped lead the implementation of this year’s SGA/GSGA restructure. The initiative created two equal and autonomous governing bodies for undergraduate and graduate students, modernizing a 50-year-old student governance structure at Emory. To jump-start the effort, which Greenbaum called “a labor of love and definitely a lot of work,” he conducted a listening tour throughout the Emory community, meeting with students and administrators in each of Emory’s schools and colleges to discuss the implications of bifurcation. He authored the strategic implementation plan that helped Emory’s 7,800 undergraduate and 7,200 graduate students usher in this seminal moment in SGA/GSGA history, with 91.2 percent of student votes in favor of the historic restructure. Graduate students compose 48 percent of Emory’s student body. Their experiences here are vastly different from that of undergraduates. “We come here in the sense that we’re going to work,” says Greenbaum. “Undergraduates have a more residential relationship with the university. For graduate students, it’s more transaction — if we don’t need to be here, we’re not here.” Because graduate students can have spouses and children in tow or work off campus while they’re here, Dooley’s Week is probably a low priority. In addition to his work on the restructure, Greenbaum served as an MBA Admissions Ambassador, a Graduate Business Association vice president, a Delta Leadership Coaching Fellow, and a teaching assistant at Goizueta. He also led the school’s 2016 admitted student weekend, one of the most successful to date, and worked as a summer intern for multiple offices at the business school. “Jared has been the living embodiment of our core values at Goizueta and a testament to how one student’s passion can positively impact current and future generations of Emory students,” says Corey Dortch, senior director of engagement and community at Goizueta. Greenbaum was able to do in the span of a year what others had tried and failed to accomplish before him. “It was a long and arduous process, but I think we’ve made Emory a better place,” he says. Thanks to him and others, students will return to school next year with a structure in place that better addresses their needs.